This article is about the interceptor from the 1940s. For the trainer from the 1960s of the same name, see here. The Yakovlev Yak-30 was an experimental Soviet interceptor from the late 1940s. Derived from the Yak-25, from which it differed primarily in having wings sweptback 35� at quarter chord, the Yak-30 retained the fuselage, tail surfaces and undercarriage of the earlier fighter fundamentally unchanged. The Yak-30 was designed to meet a Soviet requirement for a fighter capable of Mach 0.9, and able to operate from existing unpaved airstrips. To meet this request required a sweptback wing. Yakolev based their design on the existing Yak-25 experimental fighter, but incorporated a modified wing with a sweep of 35 degrees. The Yak-30 was to be very similar to the former Yak-25, with only a few changes. The new wing, designed with the help of CAHI, was swept back at a leading edge angle of 35 degrees. The wing was virtually untapered, and set at an anhedral angle of -2 degrees. The fuselage was that of the Yak-25 but with a circular cross-section. The entire rear fuselage could still be disconnected, but modified so that the Derwent V engine could be changed by removing only the aft end of the fuselage, leaving the tail in place. The tail was as on the Yak-25 but with a one-piece rudder, and slightly enlarged horizontal surfaces. The three NR-23 cannon armament were retained, and the cockpit layout was unchanged. The wing tip tanks could not be used, as they moved the aircraft's center of gravity too far forward, so they were redesigned to fit flush under the wing, midway from the fuselage. The aircraft was powered by a 1,590 kgf (3,505 lbf) RD-500 turbojet. The first of two Yak-30 prototypes was given callsign "42", and the number "5" painted on the rudder. This aircraft was successfully test flown on 4 September 1948 by pilot Anokhin, who continued test flying the aircraft until 16 December 1948. The second prototype, the Yak-30D, which joined the flight test programme early in 1949, had a 38 cm (15 in) section inserted in the aft fuselage, revised mainwheel doors forming a large section of the fuselage skinning, Fowler-type flaps in place of split flaps, increased fuel and ammunition capacity, and changes to the oxygen system and radio equipment. The Yak-30D was also fitted with air brakes on the aft fuselage. Normal loaded weight (without external fuel) was increased by 110 kg (243 lb). During testing, it reached a speed of Mach 0.935 in a dive. Compared to the Yak-25, top speed was increased by 40 km/h (25 mph) and service ceiling was increased by 1,000 m (3,281 ft). However, the swept wing was found to be unsatisfactory with poor aileron authority. 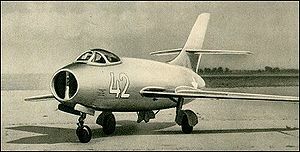 Although the modifications introduced by the Yak-30D eradicated several shortcomings displayed by the first prototype, the first production deliveries of the superior MiG-15 were already taking place by the time that the improved version of the Yakovlev fighter entered flight test, and the results of NII V-VS trials were, therefore, little more than academic. The Yak-30 designation was later reused for the Yakovlev Yak-30 (1960).